Corn, scientific name Zea mays, also known as maize or mielie/mealie, is one of the most successful cereal grasses of all time. Natives to the Americas, it is believed that the native Americans developed this plant from a wild grass called teosinte, which had small kernels and were not closely packed as the present day corn. So, corn is considered to be an invention by humans, as this plant does not exist naturally in the wild. It has to be planted and protected by humans. Researchers believe that corn was developed by the native people of Mexico, 5000 years ago. From Mexico, corn spread to other parts of the Americas and after the discovery of America by Columbus, the European people also came to know about corn and started cultivating it. Now, corn is one of the staple foods in many nations across the world. There are many varieties of corn, which are used for human and animal food and is processed to make food ingredients, like corn syrup, cornstarch, etc. Another interesting corn fact is that industrial products, like ethanol and polylactic acid are produced from this crop. While corn originates in the New World, it is grown all over the world and used for a staggering array of products. Corn is far more productive than most cereal crops and able to sustain a higher population than relatives like wheat, rye, or rice. Like most grain producing grasses, corn is an annual that must be replanted each year. Corn grows in warm weather and usually matures in late summer. The stalks can grow between three feet (one meter) and 20 feet (six meters) tall, depending upon the cultivar. At one point, there were thousands of varieties of corn in production, but these numbers have since dwindled to less than one hundred hardy, predictable varieties with large fleshy kernels. Corn grows in ears, tight clusters of kernels around a central core or cob that is covered in a leafy husk. Corn has been bred in such a way that it has difficulty reproducing without human assistance, thanks to this husk. As a commercial crop, corn is everywhere. It is one of the most intensively genetically modified crops, which has led to serious discussion and comment both inside and outside the agricultural industry. Corn is also one of the most grown crops globally, with thousands of acres being dedicated around the world to the high intensity production of corn crops. Corn is also used in everything imaginable. In addition to being eaten straight off the cob or popped, corn is used to manufacture corn syrup, a wildly successful artificial sweetener. Corn is also used to synthesize a number of compounds used in manufacturing processes, such as corn starch, which is in everything from cardboard to biodegradable containers. Corn is extensively cultivated to produce animal feed, with all feedlot animals consuming pounds of the crop each day. In addition, corn is used in the manufacture of alcohol and ethanol, a commonly used alternative fuel. Corn belongs to the grass family Graminae. Nowadays, farmers grow hybrid corns, which are developed by breeding two or more different types. These hybrids are superior to the pure cultivars in terms of traits, like tolerance to low temperature, disease and pest resistance. Corn is produced in a higher amount than any other grains. America is the highest producer of this valuable crop, contributing to about half of the global production. It is grown all over the world except in Antarctica. Peak season for corn production is May through September. This grain is rich in starch (1.25 calorie per 1 gram), proteins, vitamin B, vitamin C, and carbohydrates. Containing a high percentage of dietary fiber, potassium and antioxidants, corn is a healthy cereal. In terms of flour production, corn gives more flour with less bran than wheat. Corn is used as a sweetener in most of the soft drinks and other commercial products that call for a low-cost sweetening agent. A single corn bushel can sweeten about 400 cans of soft drinks. Seeds of corn are called kernels. Dry milling and wet milling are two main primary methods of processing corn kernels. Corns are used directly as food, as animal feed, in biogas plants, for producing corn fuel, and as a base for many of the products. The stem of maize plant is similar to that of bamboo in having nodes and internodes. The stem is erect, about 2 - 3 meters (7 - 10 feet) in height and grows about 3 millimeters a day. Some of the corn varieties are popularly grown as ornamental plants. In a corn plant, there are two inflorescences, the male and the female. 'Tassel' borne at the tip of the stalk is male part and 'Silk' is the female part. There are about 800 kernels in an ear of corn, arranged in 16 rows. One pound of corn has approximately 1300 kernels. Size of an average ear is 12 - 14 inch in length. Depending upon the species planted, corn kernel color can be white, yellow, red, or bluish black. White corn and yellow corn are the two most popular varieties. Of these, the white cultivar is smaller and sweeter than the yellow corn. Before picking corns, check the ears for kernel maturity. The same tip is applicable while buying them. As soon as corn is harvested, sugar starts converting into starch, thus reducing its natural sweetness. So, it is always better to consume fresh corn for better taste. Sweet corn leaves were used as chewing gum by the Indians. As for consumption of corn as a vegetable, boiling and roasting are the two most popular methods of cooking this cereal. Of course, it is used in many food recipes. Dried kernels are used for popping popcorn. Cornflakes contain only 8% corn. Besides using for food and related products, it is also used in production of oil, fuel alcohol commonly called ethanol, and biodegradable polyester (polylactic acid, PLA). Ethanol increases the burning capacity of gasoline and is pollution-free. Some people are sensitive to corn, and the allergy symptoms include diarrhea, vomiting, asthma, etc. They should avoid commercial food that makes use of corn as a sweetener. In Europe, it is mandatory to label any food product that contain corn. You may be interested in knowing is corn a vegetable or a grain. Corn is a grain, and sometimes called a vegetable grain. According to Native Americans, corn, bean, and squash are together known as 'the three sisters', which grow from Mother Earth. The Indians used to grow corn by digging a small hole, putting kernels and a fish (which would later provide nutrients) and then, covering them with soil. Corn, being popular as a food item, is enjoyed by people in various forms, like, whole corn, corn flour, cornstarch, corn gluten, corn syrup, cornmeal, corn oil, popcorn, cornflakes, etc. 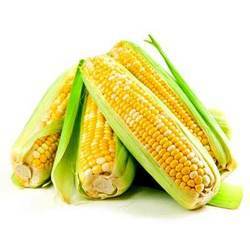 Apart from satisfying the taste buds of its users, corn is also a good source of vitamins, minerals and dietary fiber. The nutritional value of cornflakes is almost similar to that of cooked corn. One large ear of cooked yellow corn contains almost 4 grams of protein, 3.5 grams of dietary fiber, around 30 grams of carbohydrates, 1.5 grams of fat, 3.6 grams of sugar, around 100 grams of water, no cholesterol and amounts to 126 calories. Below is more corn nutrition facts and information about the vitamin and mineral content in one large ear of yellow corn, which is cooked without salt. Apart from the above said minerals, traces of manganese and copper are also found in corn. Apart from the nutritional benefits, corn provides various health benefits too. Corn, being a rich source of folate, is found to beneficial for the formation of new cells. Folate is also helpful in preventing birth defects, colon cancer and heart diseases. Thiamine in corn is good for carbohydrate metabolism, energy production and cognitive functions. Fiber content helps to reduce cholesterol, constipation and the risk of colon cancer. Corn contains a carotenoid called beta-cryptoxanthin, which is good for the health of the lungs and also prevents lung cancer. Corn can promote cardiovascular health, if consumed in moderate quantities, regularly. It is also good for people with renal problems. Corn can be boiled, steamed or roasted or can be used to make healthy snacks, like, popcorn (without butter or sugar). You can also use any food products made of corn, like cornflakes. Not only does corn tastes good, but also comes with a high nutritional value, which is beneficial for human health. The major points against consumption of corn include a possibility of fungal and microbial infection and toxicity and skewed Omega 6 : Omega 3 ratio. Besides these, some other concerns over consumption of corn happen to stem from the sugar and starch content of corn which gives this grain high calorific value. Not a very good news for weight watchers! This concern also gives rise to a very serious question - is corn oil good for you? Considering the ubiquity of corn oil in just about every processed and fried food and given its high trans fat content, corn oil is not at all a good option for daily cooking purposes. If you are a discretionary snacker and binge on those fries not more twice or thrice a month then it won't be very harmful for you! Regular consumption should be avoided. Is corn good for you? Not always! Canned sweet corn can be high in salt, with some brands containing as much as 545 mg of sodium per cup -- close to a quarter of the recommended dietary allowance. MayoClinic.com reports that excessive dietary salt can lead to fluid retention and increased blood pressure in sodium-sensitive individuals; the website recommends getting no more than 2,300 mg of sodium a day. If you are over 51, are African American or have high blood pressure, diabetes or chronic kidney disease, the recommended amount is no more than 1,500 mg per day. Look for canned corn with no added salt; the sodium level drops to a modest 31 mg per cup. Although corn isn't fattening, it is a starchy vegetable, meaning it does contain carbohydrates. Consuming too many carbohydrates and overall calories can lead to weight and fat gain. If you're overweight, the American Dietetic Association encourages you to reduce your daily calorie intake by 500 to 1,000 calories per day for a weight loss of one to two pounds per week. The American Dietetic Association also reports that reducing carbohydrates rather than calories or fat may help with short-term weight loss, and reducing your carbohydrate intake results in a reduced overall energy intake, which is effective for weight and fat loss. Corn allergies are seen in adults as well as in children. When a person becomes allergic to corn, his body develops antibodies against corn proteins. Therefore, as soon as the person consumes corn products or even inhales corn particles or pollen, the immune system reacts against it, which gives rise to allergic reactions on the body. As corn is consumed by a large number of people, the number of corn allergy cases is increasing. Symptoms of corn allergy vary from very mild to severe ones. They are also found to differ from person to person. When a person is over sensitive to corn, consuming even a small quantity of corn can result in development of symptoms. Let us have a look at the minor symptoms of corn allergy. Doctors used to advise people with diverticulitis -- an inflammation of the tiny pouches in the small intestine -- to avoid nuts, seeds and corn; that caveat is less common today. According to MedPage Today, research has shown that corn is harmless in those with diverticulitis. However, if you have diverticulitis and experience worsening of symptoms after eating corn, you should avoid it. Given both takes on the issue - is corn good for you? It can be determined that consumed in moderation and in its fresh form, corn is a great option for a healthy and tasty snack! As far as the concerns over corn allergy symptoms are concerned, let me tell you - it is extremely rare! Different people can be allergic to different things but that doesn't make that thing bad outright! Hey, we all know about people who are lactose intolerant but then the problem is not with milk, it is an issue with those people's systems which are unable to metabolize dairy! Given its high vitamin, phosphate and other nutrient contents despite the high fat and carb levels, if consumed once in a while and in moderation, corn does more good than harm!